This module is a broad introduction to the field of psychology including: sensation, perception, and attention; learning and memory; intelligence, language, and cognition; emotion and motivation; development, personality, and social behavior. 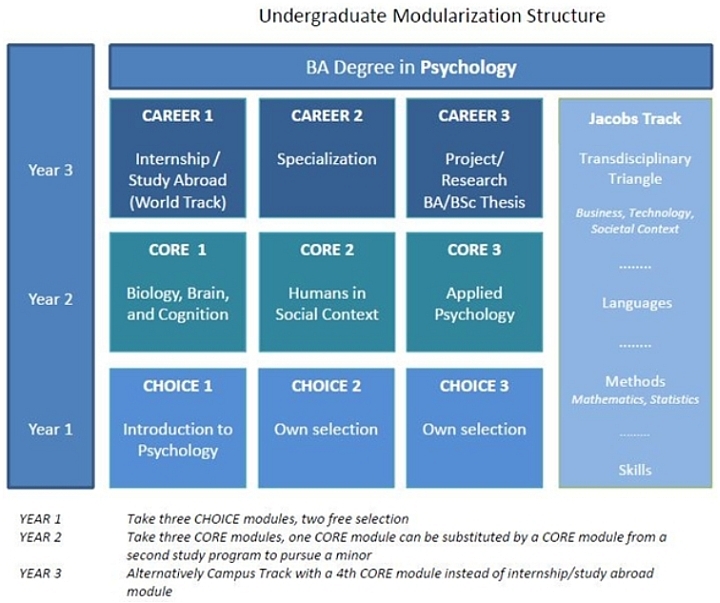 The module also teaches the research methods used by psychologists across these areas to study the origins and variations in human behavior including experimental design, psychophysics, and the rational of neuro-scientific methods. This module provides the foundation for higher-level modules in Biology, Brain, and Cognition; Humans in Social Context; and Applied Psychology. The module provides an introduction to what is known about the link between the brain, cognitive processes and behavior. Starting from the organization of the neural systems and the neuroanatomy of the brain, the module focuses on the neurobiological bases of cognitive processing in the areas of perception, motor control, attention, emotion, memory, learning, language etc. What is the social brain? How is the brain involved in making decisions? What is neuro-economics? What do drugs do to the brain and how do they alter behavior? These and other questions as well as critical perspectives are addressed in this module. The methods to study the link between brain, mind, and behavior, as well as their pros and cons, will also be discussed. Humans are profoundly social beings, and their thinking, feeling, and action is fundamentally shaped by the social context. Both proximal factors in the current social context (such as the presence or absence of others), as well as distal ones (such as evolution or culture) affect how people perceive themselves and others and how they interact with others. Specific questions addressed in this module include: How do we perceive ourselves and others? How can we change others’ behavior through social influence? Which factors predict conformity or deviance in groups? What is the role of stereotypes in intergroup conflicts? The answers to these questions contribute to improving the interactions of individuals from diverse backgrounds. This module focuses on implications of the biological and cognitive processes, as well as social and cultural factors, that underlie human behavior for applications in domains such as business, education, health, politics, and society. Three processes are central across these domains: (a) decision making (of individuals, in groups, in institutions), (b) behavioral change (in terms of marketing approaches; maintenance and restoration of health; in organizations) and (c) conflict analysis & resolution (e.g., mediation, negotiation). In all these domains, diversity plays a major role, therefore the impact of age, gender and cross-cultural variance will be addressed. The module also covers applied methods (intervention, training, evaluation).